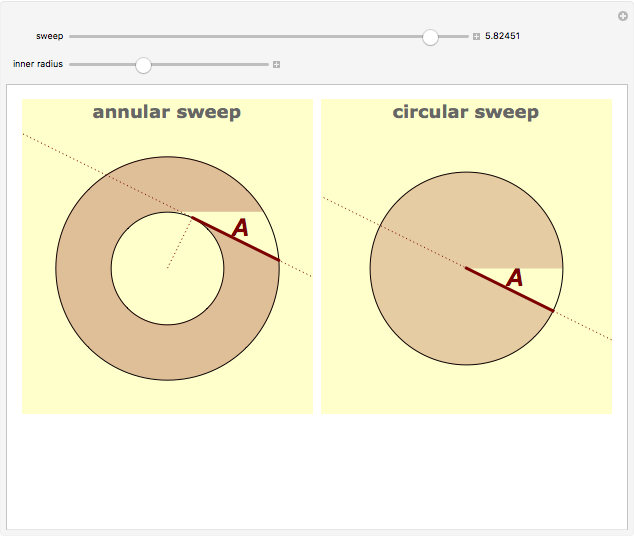 In the left diagram, line segment is tangent to the inner circle of an annular ring. 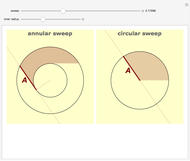 Using the "sweep" slider, you can sweep through the entire area of the ring. Simultaneously, on the right, that same line segment, —now with one end pegged to a single point—sweeps out the same area, but forms a circular disk. Surprisingly, a new proof of the Pythagorean theorem discovered by Mamikon Mnatsakanian in 1959 (first published in 1981) dramatically appears. This proof without words of the Pythagorean theorem extends from Mamikon's theorem, which is a generalization of the strategy demonstrated here of equating a set of moving tangents (tangent sweep) to their parallel translations with a common end point (tangent cluster). In general, Mamikon's theorem says, "The area of a tangent sweep of a space curve is equal to the area of its tangent cluster". Another nonintuitive conclusion spawned by Mamikon's theorem is that the area of this tangent sweep is constant and independent of the size and shape of the object that is being surrounded. The tangent sweep's total area is simply a function of the length of the tangent . For more information visit "Visual Calculus by Mamikon" or read M. Mamikon, "Annular Rings of Equal Area," Math Horizons, 5(3), 1997 pp. 5–8, also reprinted in D. Haunsperger and S. Kennedy, eds., The Edge of the Universe: Celebrating 10 Years of Math Horizons, Washington, DC: Mathematical Association of America, 2006. Of course, if your Russian is in good shape, you can always read the original publication: Proceedings of the Armenian Academy of Science, 73(2), 1981 pp. 97–102. T. M. Apostol, "A Visual Approach to Calculus Problems," Engineering & Science, LXIII(3), 2000 pp. 22–31. T. M. Apostol and M. Mamikon, "Subtangents—An Aid to Visual Calculus," American Mathematical Monthly, 109(6), 2002 pp. 525–533. T. M. Apostol and M. Mamikon, "Tangents and Subtangents Used to Calculate Areas," American Mathematical Monthly, 109(10), 2002 pp. 900–908. T. M. Apostol, "A Visual Approach to Calculus Problems," talk delivered at the California Institute of Technology, Oct. 4, 2000. 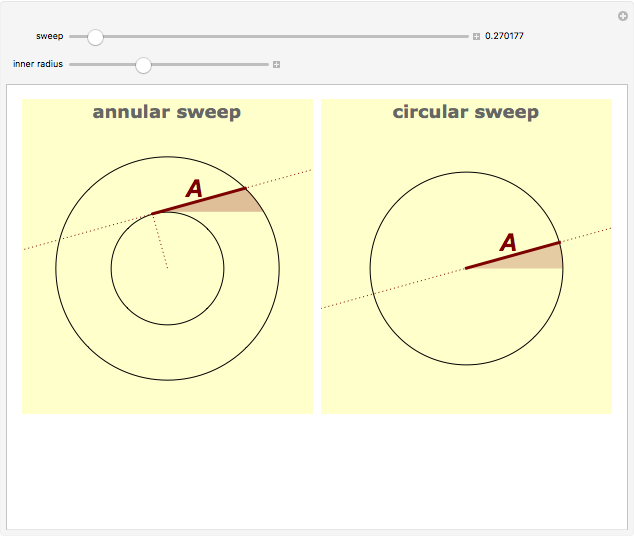 Snapshots 1 to 4 are stills hinting at the process of equating the area of the tangent sweep to the area of the tangent cluster, ending with the bonus of a proof without words of the Pythagorean theorem. Snapshots 5 and 6 demonstrate that since the area of the ring is independent of the inner or outer circles' radii, but rather a function of their difference represented by the tangent line , radically differently shaped rings can have the same area, as confirmed by the same‐sized circle on the right. Mamikon's theorem extends to any shape of the interior figure even though this Demonstration is limited to circles. John Kiehl "Mamikon's Proof of the Pythagorean Theorem"